Pamplin Media Group - What does public want in cleanup of Willamette Cove? What does public want in cleanup of Willamette Cove? Residents' opinions sought for Metro effort to cleanup contaminated Superfund site on the Willamette River. When Wilma Alcock was young, she fished all the time on the Willamette River, eating the bluegills, perch and crappie she and her family caught. But that was before its waters and nearby upland areas became highly contaminated with decades of industrial pollution. A 10-mile stretch of the Portland Harbor from the Broadway Bridge to the Columbia Slough was designated a federal Superfund site in 2000, but Alcock knew long before then that it wasn't safe. "It got to the point where we couldn't eat the fish because it was so toxic and dangerous," the now-80-year-old recalls. "That is something that has been taken from people that loved to fish that area." She hopes that one day, the river will once again become a place where people can swim, fish and boat without fear of getting sick. "I probably won't see it in my lifetime, but you have to start somewhere," she said. Alcock serves on the steering committee for the Portland Harbor Community Coalition, a group that formed in 2012 with a mission to elevate the voices of disproportionately impacted communities with ties to the river and upland areas, including Indigenous communities, Blacks, immigrants, refugees, homeless people and local residents. The group wants to ensure that those most affected can benefit from and help lead the cleanup, restoration and redevelopment of the harbor. The coalition helped educate community members about the river and submit more than 5,300 comments about the federal Environmental Protection Agency's draft cleanup plan. "We significantly pushed the dial based on how many people submitted comments in favor of a more robust cleanup plan," coalition coordinator Cassie Cohen said. The group is gearing up again to steer a public involvement process as the Oregon Department of Environmental Quality, the Port of Portland and Metro work to finalize a cleanup plan for the Willamette Cove property – one of the most complicated sites in Metro's portfolio of parks, trails and natural areas. Metro purchased the 27-acre property in the St. Johns and Cathedral Park neighborhoods of North Portland in 1996 using money from the 1995 natural areas bond measure. Plans to redevelop it into an urban natural area and extend the North Portland Greenway Trail were stalled when high levels of contamination were found throughout the site. The focus, instead, shifted to cleanup efforts. Since 2001, Metro has worked with the Port of Portland, a former owner of a portion of the site, to assume the role of potentially responsible party and determine the level of contamination, possible remedies and develop plans for the final cleanup of the site. "Potentially responsible party" means any individual or party potentially liable for cleanup. In 2015, soils with the highest levels of contamination were removed from the upland areas and trucked to a landfill south of The Dalles. But contamination still remains throughout the site and in the river that pose risks to human health and the environment. "Here, you have a highly contaminated site where suddenly in and around the asphalt of old historical use, you have native trees growing," said Katy Weil, senior science analyst for Metro. "Many birds and bugs use those trees." Cleanup options range from removing all of the contaminated soil to more of a hybrid approach, where the worst of the contamination would be removed and the rest of the site would be capped with clean soil and monitored to protect the public and wildlife from pollution. "It's one of the few sections in the Portland Harbor Superfund site that's in public ownership, which means that everyone has a stake, and we have to define what level of access is safe and consistent with Metro's role in the region," Weil said. She says keeping the public involved and informed is important, and groups like the Portland Harbor Community Coalition are helping to give voice to people who might not ordinarily be heard. "You can get mired in the details, but it still comes down to people needing to know what's going on in the water, what's going on in the land around the water, and how and when it can be cleaned up," she said. "What we don't want is for people to say, 'That's an exercise in futility; I have no voice.'" Taking public input into account, the Oregon Department of Environmental Quality will decide which remedy is most appropriate for the upland portion of the site. The coalition received $9,000 from the Port of Portland to train four to six leaders who will then facilitate meetings within their own communities. The goal is to help people understand the cleanup options, encourage them to submit public comments and give them an opportunity to provide input about the future uses of the property. "This is public land, so the public has a right to determine what happens with that land," Cohen said. She said the community's input should dictate how extensive the cleanup will be. 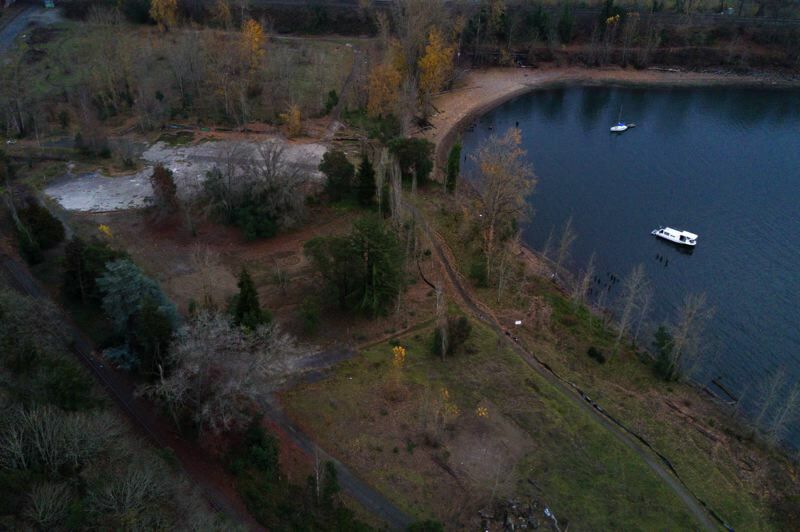 If, for example, community members say they want to be able to swim in the water, play on the Willamette Cove beach or enjoy the wildlife, then the remedy plan should be revised to fit those future uses. "If you clean it up only enough for habitat and not people, then the cleanup level would be lower," she said. "But if the community wants access to the site and water, that requires more money." Weil says it's important for people to be able to share their hopes about the site. She also emphasized that it is important for the public to understand what it would take to achieve them. hiking, boating and education opportunities a few miles north of Willamette Cove at Smith and Bybee Wetlands Natural Area. Other partners have expressed interest in stepping up to do more with Willamette Cove, including possibly taking over management and ownership. "Everyone would like to respond to what the public asks for and wants," Weil said.